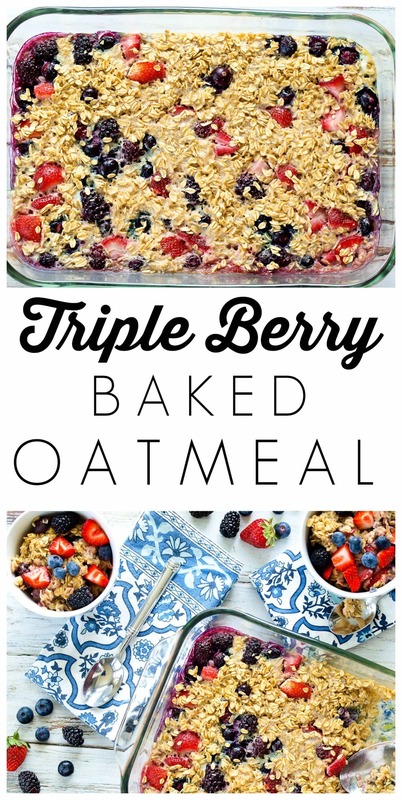 This Triple Berry Baked Oatmeal makes an incredible, warming breakfast that is healthy and light! I’ve got another baked oatmeal recipe for you! These days I’ve been eating a lot of steel cut oats. They simmer on the stove in the morning while I’m working (before the kids wake up) and I really don’t mind the wait. Sometimes, though, it’s nice to switch it up. By switch it up, I mean instead of steel cut oats, how about some baked rolled oats? I’m crazy like that. Baked oatmeal is simple to throw together. You mix up the ingredients in one bowl and throw it in the oven. What comes out, about 20 minutes later, is a warm and puffy oatmeal bake that everyone loves. Some baked oatmeal recipes have a ton of sugar–so much that they could be classified as dessert. This one is lightly sweetened with a little maple syrup. It’s more than enough sweetness for me (I usually just use a banana to sweeten my steel cut oats), but you can always top yours with a little more if you think it needs it. Berries are some of the best fruits, health-wise, on the planet. Their vibrant colors indicate that they are rich in antioxidants, which help our bodies fight free radicals that can lead to illness. I eat berries, whether fresh or frozen, all year long. They are also great inflammation-fighters. 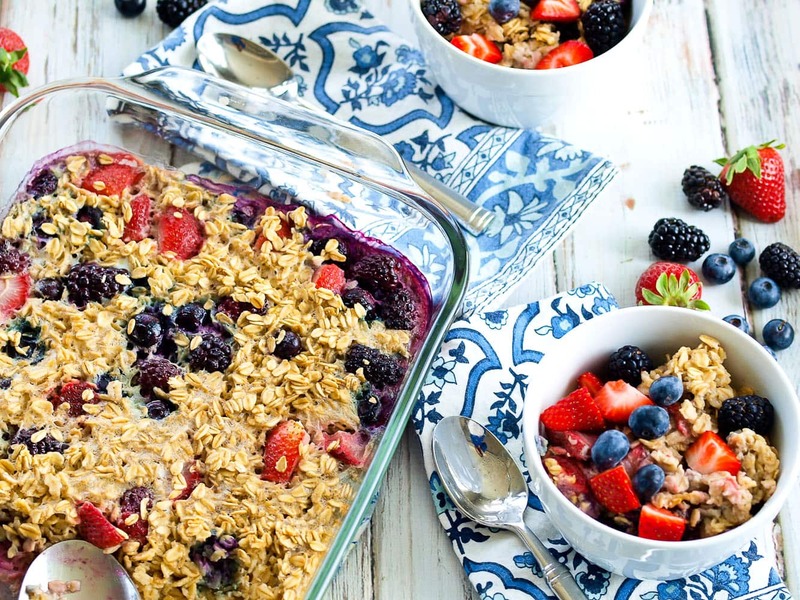 The warm berries dotted throughout this healthy baked oatmeal recipe add a perfect sweet and tart flavor to the oats. Baked oatmeal is just as good for leftovers as it is fresh out of the oven, so go ahead and make a batch to enjoy today and tomorrow! 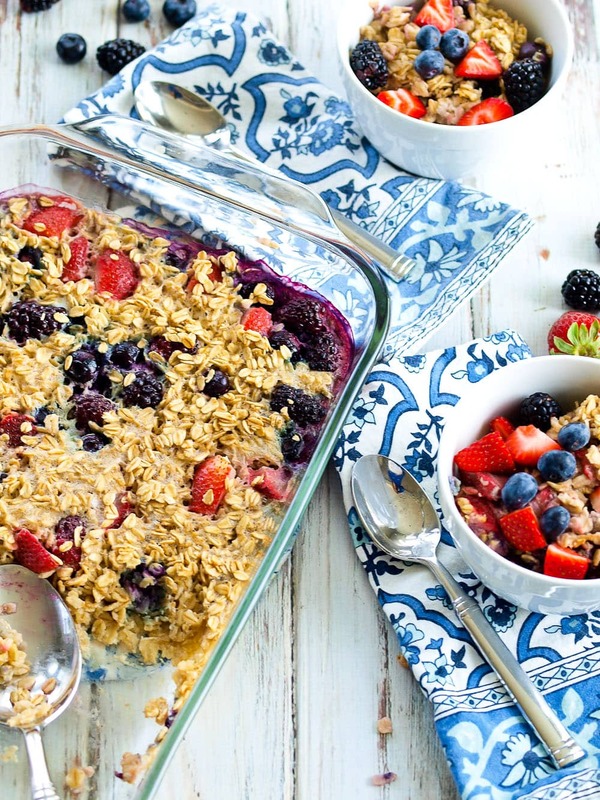 This Triple Berry Baked Oatmeal makes a light and healthy breakfast. It’s easy to make, much lower in sugar than traditional baked oatmeal, and so delicious! Preheat your oven to 375 degrees. Grease a medium baking dish and set aside. 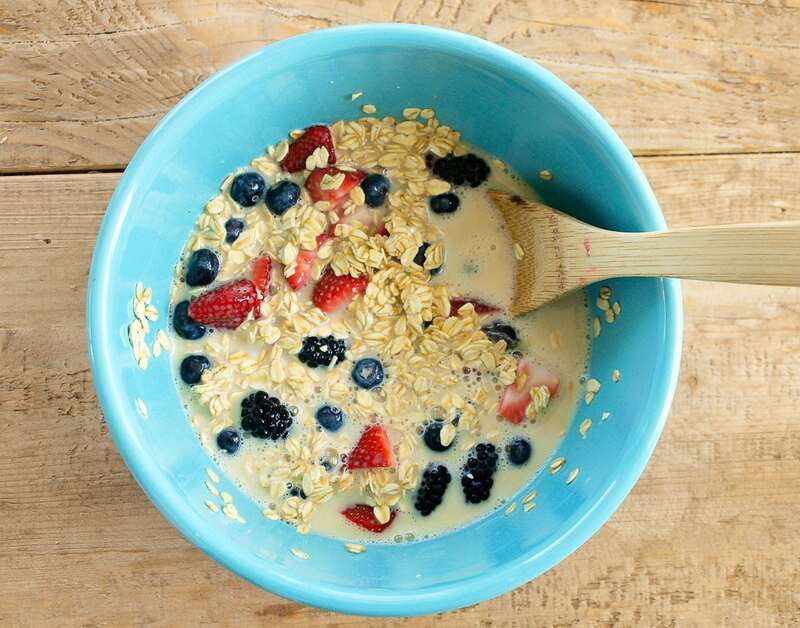 In a medium bowl, mix together the oats, baking powder, and salt. Add the milk, maple syrup, egg, and vanilla. Stir well. Stir in the berries. Pour the mixture into your casserole dish. Bake in the preheated oven for 20 minutes. Enjoy! *I prefer unsweetened vanilla almond milk. Any milk will work here. You may also love my Lemon Poppyseed Baked Oatmeal recipe! Gaaaah! It’s so vibrant! I love baked oatmeal and could definitely go for some triple berry action. This is a real must-make! Love this recipe! So far I have made it with berries and mangos too! everybody loved it! I’m so glad to hear that! Thanks for letting me know. I think I need to try it with your mango idea, too! My son is allergic to strawberries, can I use bananas or any other fruit? You can leave out the strawberries and add more of the other berries. Bananas would be great, too! How gorg is this?! Your pictures are STUNNING. Cheers to another delish and easy breakfast! Sounds yummy! What temp do you bake it at? After seeing this i realize id rather have my oats baked then cooked. Dang this looks phenomenal! Bright and vibrant. Thanks, Kelsey! I like them both ways, but this way is definitely fantastic. For some reason I just hate oats, but this looks yummy! great recipe – tried it this morning and it was DELICIOUS! i used frozen berries so ended up baking it for an extra 5 minutes or so. thanks! I made this today and I must say, it’s delicious! I used strawberries and blueberries and it turned out wonderful! Thank you for sharing your recipe! Yes! I usually use almond milk for this recipe. Can you skip or replace the maple syrup with anything else? It depends on how sweet you like your oats. If you don’t mind them not having a sweetness, you can leave it out. I would recommend using an alternate sweetener, though. Honey or agave nectar would work, or you can also use Sucunat or coconut sugar. I make this one all the time…makes breakfast easy! Can I use steel cut oats ? What alterations should I make? I haven’t tried baking steel cut oats. It would definitely need to bake longer. I would add a bit more liquid also. Please let me know if you try it! can we also use instant oats instead of the old fashioned ones?? Hi! Can we fast cooking oats or should it be normal old fashioned oats? I like the texture better with the old fashioned oats, but quick cooking does work. How long we can keep it ? can I prepare it the night before and stick it in the oven in the morning? I used frozen mixed berries, coconut milk, & a pinch of cardamom. I extended cooking time 15 minutes, and it turned out beautifully! Thanks for sharing this superquick, supereasy delicious recipe! Such a superb recipe! I used unsweetened vanilla coconut milk, and while it was baking, I toasted some coarsely chopped pecans on the stove and sprinkled them on top for the last five minutes. Will make this over and over! Easy and GREAT!! I love this recipe! So quick to prepare before school! My girls devour it. Thank you! My first thought is to serve with a good dollop of whipped cream!I’m ready to try this tomorrow!